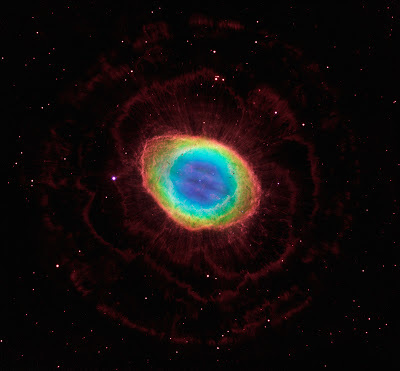 I did not talk about it in the article, but there is another spectacular image of the Ring Nebula that combines observations of Hubble Space Telescope with that of the Large Binocular Telescope (LBT) in Chile (see the image below). Here you can see wispy hydrogen gas (red) that surrounds the Ring Nebula. It is the result of earlier ejection of gas from the star.